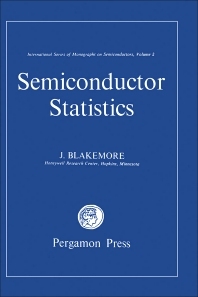 Semiconductor Statistics presents statistics aimed at complementing existing books on the relationships between carrier densities and transport effects. The book is divided into two parts. Part I provides introductory material on the electron theory of solids, and then discusses carrier statistics for semiconductors in thermal equilibrium. Of course a solid cannot be in true thermodynamic equilibrium if any electrical current is passed; but when currents are reasonably small the distribution function is but little perturbed, and the carrier distribution for such a ""quasi-equilibrium"" condition is inappreciably different from that of thermal equilibrium itself. Thus the results of Part I are not invalidated when the properties of a semiconductor are measured using small current densities. Part II considers non-equilibrium statistics for semiconductors with appreciable excess carrier densities. The various kinds of recombination mechanism are examined, and the consequences discussed for steady state and transient situations. The subject matter of this book was deliberately restricted in scope in order to be of maximum value to scientists with an active interest in the basic properties of semiconducting materials.